Using one of our hoop houses for season extension, we have had good success in cultivating organic ginger and turmeric on the farm. Although these are tropical crops they can thrive in a protected environment. Our next harvest will be fall 2019. Please email us if you have any questions. 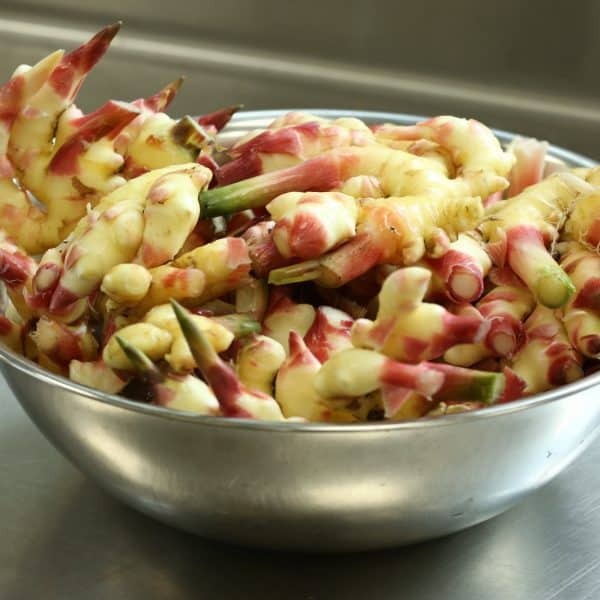 Ginger creates a wonderful product when harvested early in its life cycle as ‘baby ginger’, that is at the stage where the hard brown coating has not yet formed and the ginger has a lovely pale pink glow. At this stage it can be used without peeling. It is wonderful for juicing, soup and stew making, beverages etc. It can be sliced or grated and frozen for use throughout the winter, or dried for ginger tea. We use it in our farm kitchen for our sushi ginger. 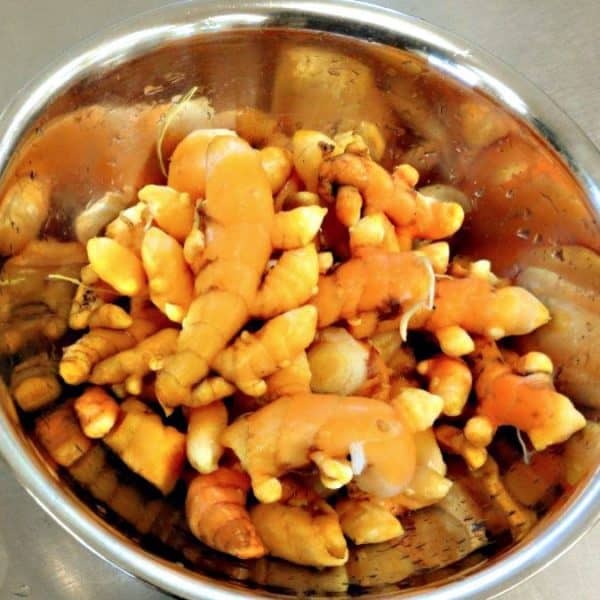 Freshly harvested organic turmeric root has an intense golden or orange colour that even looks full of goodness. Fresh turmeric can be used in smoothies, fresh pressed juices and teas. It can also be added to a variety of soups, stews and other dishes. To use the freshly grated root in marinades for chicken, fish and beef simply add 1 teaspoon of the peeled and grated root to any marinade recipe for a flavor and color kick. Turmeric can be frozen whole or grated for easy use throughout the season. Turmeric (Curcuma longa), the main spice in curry, has been called the most powerful herb on the planet at fighting and potentially reversing disease. It is well known for its anti-inflammatory properties along with a host of other health benefits.